Savor the Spectrum Wine Difference Our elegant and fun wine pourer designs will floor your friends and guests. Spectrum Wine Specialties master-craft wine pourers are perfect for wine tasting parties, family get-togethers, and celebrations with friends. We have a wide variety of wine pourers to cater to a variety of people. This wine pourer is made of high quality stainless steel with a silicon base for smooth and sure sealing. The tube provides aeration of the wine as it's being poured. This provides two desired effects: oxidation and evaporation. Both of these are essential to releasing the delicate flavors and aromas of the wine without the need of a decanter and time to "rest." The entertaining designs never cease to garner attention at gatherings. A perfect gift for the wine-lover in your life. Like to have a "bear-of-a-time" at the parties? We have the perfect wine pourer for you! Food-Grade Silicon Stopper for a sure, smooth seal, every time! 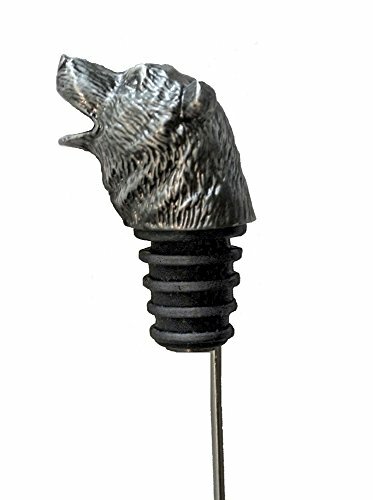 Bear pourer aerates your wine without the need of a decanter-- and looks great doing it! Why settle for just wine? Bear works with all manner of Whiskey, as well! Makes a great gift for the discerning wine or whiskey buff (including yourself)! If you have any questions about this product by Spectrum Wine Specialities, contact us by completing and submitting the form below. If you are looking for a specif part number, please include it with your message.